Pia Wurtzbach drops a few hints about her upcoming projects. 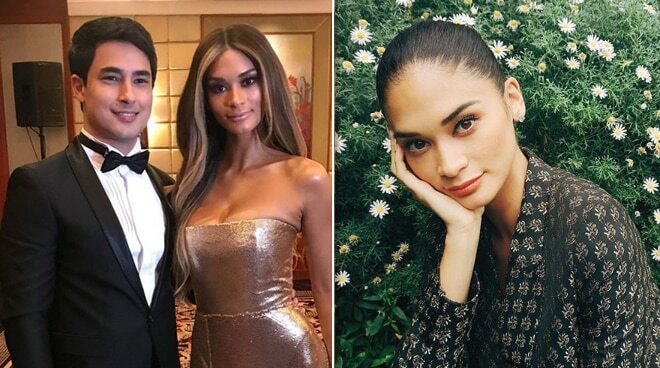 “He’s very much into fitness, so we work out together,” reveals Pia Wurtzbach about her boyfriend, race car driver Marlon Stockinger. There were rumors that the two parted ways after Pia posted a photo of a pair of boyfriend jeans that she captioned, “No boyfriend? No problem.” Thankfully, she was able to clarify the issue during the ABS-CBN Ball, which she attended with Marlon. Her current toned physique is a product of her hard work. “It’s all about the discipline,” advised Pia. “You can have a very good trainer. You can do a really heavy workout. You can have a great diet. But if you go home and you don’t follow and you’re not consistent, it’s not going to happen. “I feel stronger. I feel better. Overall, I feel good about this, and I don’t want it to end just because natapos na ‘yung photoshoot.” It took her three grueling months, but it was worth it. In fact, it’s a lifestyle she plans to live by. “Healthy living na talaga. I want to continue my fitness journey. I have other goals now. I want to see how far I can go with my body and fitness. Pia may just have dropped major hints about what she is going into next. While Pia keeps her peace regarding questions about Kapamilya actors Bea Alonzo and Gerald Anderson, she willingly shared about an upcoming project she has with the same network.